Premier Auto Trade has released a new range of battery testers as part of the PlusQuip Tools and Equipment range. The PlusQuip range includes products for the professional technician involved in the diagnosis and service of engine management systems. 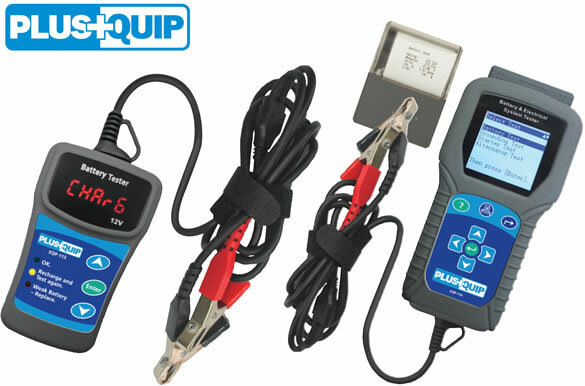 The PlusQuip EQP-113 is a lightweight battery tester that uses the latest battery testing technology for a fast, accurate and consistent report on the battery condition. This cost effective easy to use 12 volt tester incorporates a clear illuminated LED text display, as well as colour coded status lights, to eliminate any results misinterpretation. The PlusQuip 12 Volt Battery Tester gives a clear indication on whether the battery requires charging and then retesting, replacement due to a poor performance result, or the battery is acceptable for further service. The EQP-114 features a 1.7metre heavy duty cable that allows for ease of operation when carrying out any tests, and is supplied in a robust storage and carry case. Both the EQP-113 and EQP-114 are suitable for a variety of batteries including conventional wet type, low maintenance, flat spiral, maintenance free and gel cell batteries. PlusQuip products are workshop quality and all come with a 12 month warranty and technical support.